We're getting near the end of summer! There's still time to read a few more books before school starts! Try these books and series recommended by middle graders FOR middle graders! 9 year old, Jenna, recommends Percy Jackson and the Olympians: Lightning Thief: The Graphic Novel (Percy Jackson & the Olympians), by Rick Riordan. This is an action packed series about a special kid named Percy Jackson. He soon finds out that not only does he suffer from ADHD, he's also half mortal and half immortal! His father is a very powerful Greek God, to boot! Without giving too much away, join Percy in this book series as he tries desperately to keep the peace among the Gods and Goddesses! Get a lesson on Greek Mythology while you're at it! 12 year old, Lydia, recommends Keeping Secrets: Timber Ridge Riders (Volume 1) , by Maggie Dana. Kate McGregor has a new job this summer as a helper to an injured riding star who is now confined to a wheelchair. Get lost in the drama that unfolds at Timber Ridges and find out how Kate's deep dark secret ends up saving the day after all! If you like Keeping secrets, purchase book two, Racing into Trouble: Timber Ridge Riders (Volume 2) and Riding for the Stars, Book Three in the series. 11 year old Luke recommends Scorpia (Alex Rider Adventures (Pb)), by Anthony Horowitz. This is book 5 in the Alex Rider series. Alex is a teen spy, who has found out some pretty startling news about his father. This thrilling adventure includes lots of violence and terror, but will definitely keep you at the edge of your seat! 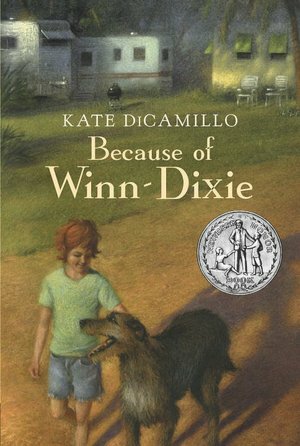 10 year old Maggie recommends Because of Winn-Dixie[ BECAUSE OF WINN-DIXIE ] by DiCamillo, Kate (Author) Feb-10-09[ Paperback ]. Opal, a ten year old little girl, living in a new town is saved by a scruffy little dog. Her mother abandoned them years ago and now Winn-Dixie has provided all the love and companionship a girl could ever need. Again, beware! This is a tear jerker! Watch the movie when you're finished with this one! What are your kids reading? We'd love to hear!! disclosure: Thank you to the authors/publishers that have provided me with books. As always, all of my thoughts and opinions are my own. Lydia's favorite book when she was 10 was Because of Winn-Dixie. Imagine her excitement to move to the south where they actually have Winn-Dixies!! (Of course, I'm partial to my northern Wegman's!) Great picks.